Upgraded for more power and even quieter operation. 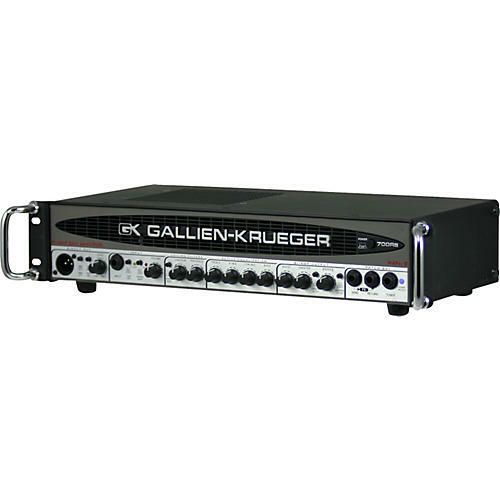 Take charge of the bottom line with the Gallien-Krueger 700RB-II Bass Head -- a state-of-the-art monster designed to deliver maximum performance with minimum fuss. An extremely high-current power supply and matching power amp circuitry extract every ounce of this head's awesome output. Its high-current design eliminates the need for current-limiting circuitry that muddies your tone. The biamped design delivers 480W to your woofer and 50W to the horn using an electronic crossover for seamless 2-way sound. 4 bass-specific bands of active EQ give you ultraprecise tone-shaping power. 3 voicing filters help you further shape your sound. 2-year warranty. Get that G-K growl you crave. Click or call to order now!